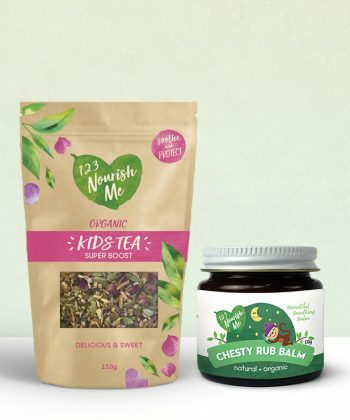 Super sweet, super yummy, kids tea is here! Kids love the sweet, delicious taste! Builds happy kids one cup at a time! Organic liquorice root, organic ginger root, organic cardamom pods, wildcrafted murunga (kakadu plum), organic cinnamon, organic dried rose petals. Liquorice Root is used for various digestive system complaints making it great for sore tummies and can sooth inflammation in the lining of the stomach. It’s also brilliant for sore throats, bronchitis, coughs, and infections caused by bacteria or viruses and we use it in our immune booster tea because of its high therapeutic activity and because it makes our tea taste sweet and yummy! We only use the highest quality organic liquorice root available. The medicinal uses of ginger have been known for at least 2,000 years in cultures all around the world. We include it in our tea because of its amazing immune boosting properties and its rich source of antioxidants. Ginger Root has a broad range of therapeutic actions including being antibacterial, antiviral, anti-parasitic and it is a wonderful herb to use to fight coughs, colds and sniffles. We only use the highest quality of organic ginger root available. Cardamom is related to ginger and can be used in much the same way to counteract digestive problems. We use it in our tea to combat nausea, acidity, bloating, gas, loss of appetite, constipation, and much more. This spice helps the body eliminate waste through the kidneys and is an immune tonic. We only use the highest quality organic cardamom pods available. This miracle of nature is from the Kimberleys in Western Australia and is a potent, natural wholefood source of Vitamin C and lots of other essential minerals. We only use the highest quality organic ceylon cinnamon in our products. We love cinnamon because it’s a powerful spice for treating muscle spasms, vomiting, diarrhoea, infections and loss of appetite. It’s great for blood sugar regulation and another immune booster and gives a warming delicious flavour to our teas. We included these not only because it makes our teas look super pretty but because these delicate pink/red flowers make our tea fragrant and fruity and are rich in natural antioxidants and are good at relieving tummy cramps. My 4 year old loves this tea. Love this tea. My kids will have it occasionally but it is now my daily ritual when I wake up instead of a coffee. Great with some Manuka honey. We are all enjoying this delicious tea! My son is now 12 years of age and has been using this tea for the last couple of winters as a evening tea before bed. We as parents have our own tea or tumeric drink before bed so he also shares the moment with his own Kid’s Tea. He has his own teapot and makes it himself. so lovely, perfect for winter! Unfortunately my girls didn’t like this, I think it may be a bit too sweet for them. However, following another reviewers’ suggestion I use it to make gummies for their lunchbox. 1 cup of kids tea, 1 tablespoon of raw honey, 1/4 cup lemon juice, just under 2 TBS grass fed gelatin and 1/4 cup kombucha (at the end once it is luke warm). They love them! Tastes great, kids love it and this mumma drinks it too!! My 10 yr old daughter looked at my strangely when I served her this tea. She now loves brewing up her tea and has a nice calming effect. Delicious and sweet. My 2 yr old loves having his tea in the morning after breakfast. Tried this at my sister’s place and immediately fell in love. Yummy and naturally sweet! My children loved it. Will be re-ordering when the time comes. This gets consumed quicker than the time taken to boil the kettle! Kids absolutely love it. I received my order today. Immediately made up some tea. My 2.5yr old twins absolutely loved it & 7yr old had his own after school & asked for more! Flat out getting these kids to eat veggies etc so really hoping this tea & the Magic Sprinkles gets them some goodness! I liked the tea too . So excited to try our latest purchase! Little mr 2yrs, helping mix his own tea… time to build up our immune system after surviving a weekend of being sick. It smells fantastic!!! We love this tea! Being a naturopath, I chose it for the health benefits, but it actually tastes amazing as well! My 9 year old is the world’s fussiest eater, and even he likes this tea! As in, he actually asked for it. So I’m building his immunity, and he doesn’t even know it! I think I actually like it just as much, if not more, than he does! We’re big fans, thanks Alisa! I love knowing my kiddies have an extra shield of protection over the winter months. We have our tea in the morning before leaving the house and what a great way to start our day with a healthy gut. My daughter thinks the little roses are from the fairies. Thank you for your gorgeous creation of health. My 4 year old has the sniffles a lot from kindy so we thought we would give this tea a try. She loves it! It has a beautiful sweet liquorice like flavour and is such a treat on these cold mornings. What a really yummy treat and and alternative to sugary hot chocolate. We love this tea so much! The kids and I will sit down with my fancy tea pot and have a up each, so far so good Miss 7 has missed the colds going around! Would love to see multiples of this pack in a bundle as we go through this so fast! 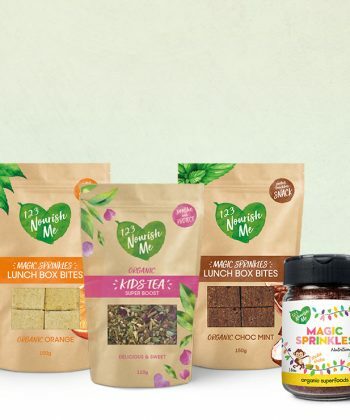 When the beautifully packaged items arrived and my kids saw the words ‘Kids Tea’, they were super excited that this tea was just for them! They couldn’t wait to try it! They loved seeing the rose buds and were so impatient while waiting for the tea to cool down. When they tasted it – they both loved it! We all did! Thank you for this beautiful product and for helping us look after our children’s health. This tea has become a new ritual for after school time. Super nice during the cold weather too, my kids can curl up with a warm cup of this nourishing tea while doing their home readers. Miss 6 & Mr 8 weren’t huge fans of this as tea (was their first try at any tea & the concept was lost on them) so I popped in honey and good quality grass fed gelatin and made gummies in fun shapes. HUGE HIT here and perfect addition to their school lunch boxes when everyone is sick around them at school. This tea is the bees knees! 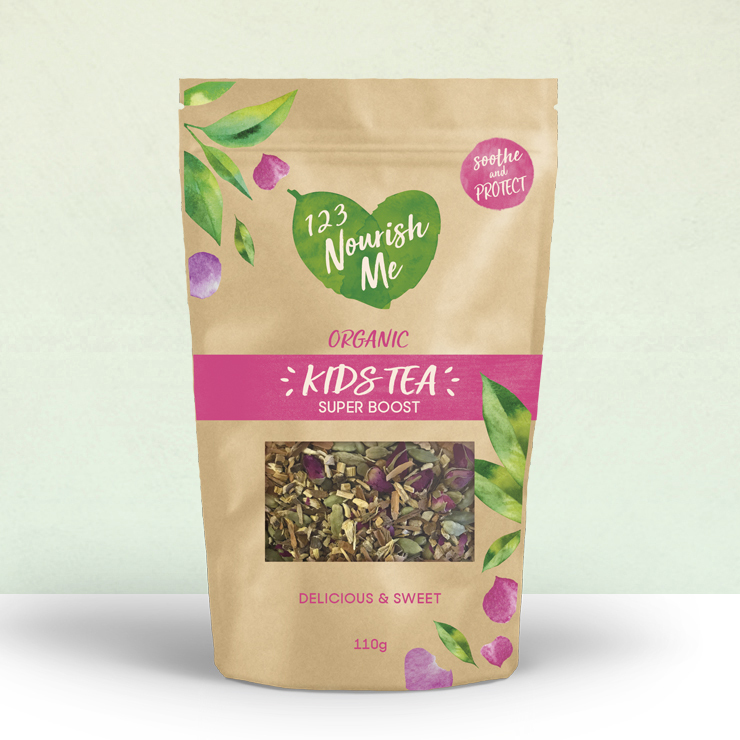 It has a great taste and although I don’t have kids, I work with them and have found this tea boost MY immunity so well ! Thanks! My nearly 3 yr old loves her tea! It smells beautiful, and it’s nice to be able to share a cuppa with her. I can’t comment on whether it’s helped her immunity, but it’s full of good things so I don’t hesitate in giving her some everyday. Love this tea! Will buy again, wish it came in bigger packs! He loves the taste, with or without honey. It also makes a really nice iced tea! Thank you! We love this tea! It’s a hit in my household for adults and kids. It’s often served hot, cold or even as gummies. Just wished it came in a bigger pack. Love, love, love it. My boys all love this with a little manuka honey. I make a pot in the morning and if there is any (rarely) left over we freeze it for after school ice blocks. 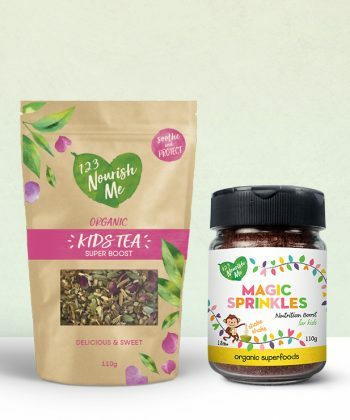 My two boys love to drink tea, so when I saw this tea I was super excited, being organic and so good for them, I had to buy it and they love it so much!!! I bought it with intentions of just my kids drinking it, not myself, but I had a cup one day to try it, and now I get so excited when I get to sit down with my freshly brewed cup at night, its just ridiculously crazy how amazing this tea tastes!!!! I will be so devastated if you ever stop making this tea, so please pleeease don’t ever stop!!! I’m buying more, like 2 or 3 of them right now! Thank you so much for making this gorgeous amazing tea!!!! Just a beautiful product!! My little girl is excited to drink it and i even sneak a little sip in there- its delicious! ! Will be ordering again and again!! I have very fussy boy… I just want to give it to try . Im so glad he likes the tea with honey ! I’m surprised my almost 4 yo daughter enjoyed the tea on her second go !! We are not a tea drinker here, but I loved straight away…. with a bit of honey even more!!! So good to be able to enjoy a tea made from real and organic products and it’s good for you!!! I’m very happy with this product! Wonderful thank you so much Karen! This tea is beautiful. Smells and tastes divine. I’m loving it hot, warm and also drinking it cold.. I’ll definitely be reordering. so yummy!!! my kids and i love this. one likes it with the honey and lemon. i prefer it on it’s own. the smell is just amazing. this is one of my very favourite teas now 🙂 i especially love that everything is organic. Add your product photo HERE (Allowed file types: jpg, gif, png, maximum file size: 2MB. Disclaimer: Please note that we are not doctors or healthcare professionals and some of our products are not TGA listed, tested or approved. The informational content we provide is based exclusively on our own research, opinions, and personal experience. It is not intended to diagnose, treat, and/or take the place of medical treatment prescribed by a doctor or medical professional. If you are unsure about anything on this website please seek advice from a medical professional. Want to know which numbers to avoid when shopping? You can grab yours here! We will never spam you and we take your privacy seriously.